We saw here that the market values of home builders track reasonably well with their book values, and we saw here that currently most builders are trading at a discount to their book values. M/I Homes (MHO) is one such company on that list, trading at a healthy discount of 58% to its book value. MHO's debt to capital level sits at just 30%, while others on that list are flirting with much higher debt levels. On the surface, MHO appears as though it could be a value play, and warrants a closer look. Upon further inspection, it turns out that not all shareholder equity is owned by the common shareholders. A good chunk of it is in preferred shares, which trade as separate securities (MHO-A). If we back out the value of the preferreds, the discount to book value changes from 58% to just under 49%, which still remains relatively attractive. But the question of future writedowns remains a concern for this industry, as we discussed here. MHO is not as geographically diversified as many other home builders, and has a large percentage of its business in Florida, one of the hardest hit areas of the housing crash. In fact, the vast majority of MHO's $22 million in writedowns in Q1 took place in Florida. But even if MHO requires writedowns of the same magnitude as what they had last quarter ($22 million) for the next four quarters, they would still be trading at a 35% discount to book value for common shareholders. At their slow sales pace of last quarter, they would get through their inventory in about one and a half years. As an aside, I am a little bit concerned about management excesses. During the real-estate bubble, it seems they went out and bought a rather large airplane. To lower costs, they traded down to a smaller plane last quarter, picking up $9.5 million in the trade. It's a move in the right direction, but nevertheless it seems rather strange that a $500 million home builder requires its own airplane, but perhaps I'm just too nitpicky. Overall, however, this company appears to have been over-punished by the markets, and as such offers a margin of safety. I would recommend this stock be owned as part of a long-term, well diversified, value portfolio. I decided to go for a bike ride out in the country this afternoon since I knew that I would be getting an extra dose of calories during dinner at my mother in-laws later this evening. I set off enthusiastically after doing the requisite research with Google maps to ensure that my planned route actually had roads to travel on. As I turned the pedals on my mountain bike I kept my brain active by establishing parallels between two of my favourite activities, bicycle riding and value-investing. Cycling away from the city towards the country had the pleasant effect of taking me away from automobile traffic. This distinctly contrarian action allowed me to take more than my fair share of the road, as there were absolutely no cars following me once I had gone around 5 km out of the city limits. Similar to my observation of the benefits of low traffic on country roads, if you invest in sound companies that are not popular or are currently out of favor, you have an opportunity to obtain more shares for your dollars then when a stock is popular. Combined with an informed understanding of a company’s intrinsic value, the industry it competes in and any competitive advantages that it might possess, I believe you can obtain excellent investing results as other great value investors have done before us. I turned left on Ranger Rd. and shortly thereafter watched in horror as the largest Rottweiler I have ever seen tried to intercept my course with an extremely aggressive sprint in a near-perfect diagonal run that would have bested any in this year’s Euro Cup. The loose “beast” must have picked up early sounds (or scent) of my approach. My recent MBA degree from the Richard Ivey School of Business was put to quick work. Operationally I should have the advantage on a bike as long as I maxed out on acceleration immediately. Financially it made sense to speed up since the time value of money dictated that I should get home asap to start on another company intrinsic valuation. Economically I was on solid ground as Adam Smith would advocate self-preservation and the invisible hand would take care of the rest. Strategy was a no-brainer, I needed to implement this plan or I was dead. Almost instinctively I put everything into accelerating the bike and just barely avoided the savage onrush. Even as I was cycling for dear life ahead of the massive dog, it relentlessly pursued me, testing my reserves and only giving in when I had a sizable distance opened up between us. My parallel to investing became obvious. I needed enough reserve energy to survive this encounter and companies need enough cash flow to survive unexpected events. During a speech by Walter Schloss, I learned that this great value investor avoids companies with “high” leverage because he doesn't want to take the risk that they will be unable to have enough cash to weather unforeseen “business storms”. This is an important lesson for value investors and Walter’s impressive track record is a good reason to take heed of his advice. George Soros came to mind shortly after a second attack on my life was launched by a German Shepherd. Luckily on this day I had enough energy reserves to survive the test. George’s famous “sore back” comes on when the flaw(s) in his investments are not known to him. My bike-ride flaw was travelling on unknown roads without a stun gun. When you invest in companies you should think critically of the things that can go wrong in the industry, the company, with customers, with management and so on. It is only after careful consideration of the facts that an overall assessment of the investment appeal can be made. This is why Benjamin Graham’s “margin of safety” is such a valuable tool to apply to the intrinsic value estimation of a company. After diligently calculating the intrinsic value of a business, methodically apply a discount factor to this value to reach an entry price for the company’s stock. The margin of safety gives you some extra assurance that you are getting a good purchase price for the stock. After all, as with cycling, you can never be certain of precisely all the events that will transpire and affect a business. 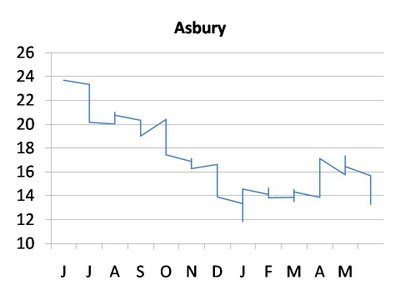 At first glance, Asbury Automotive (ABG) looks like it could be a value play. It trades at a discount to its book value, has a P/E of 7, and pays a dividend of almost 7%! Asbury also does not have it's own financing arm, and is therefore relatively shielded from the current situation in credit markets. Its presence in the luxury car segment should also help protect it to some extent from the current downturn, and its largest profits come from vehicle repairs, which consumers require no matter what the state of the economy. So what's wrong with this company...isn't it a clear buy? Well there are a few areas of concern. To me, their problems stem from their debt levels. Their operating income is only 2 times interest expense for one thing, yet they payout roughly half their net income in dividends. If things were to turn south, they have very little protection to be able to make these payments. It looks like debt holders have recognized this, and are wary. They have placed covenants such that Asbury has a ceiling on what it's allowed to pay shareholders (in share purchases or dividends), and this ceiling only grows at 50% of net income (as it's accrued), minus payouts. At the present time, that ceiling stands at just $13.2 million, which is just about 40 cents a share! Imagine a company so restricted, it's not allowed to pay it's owners even half of the cash it has on hand! 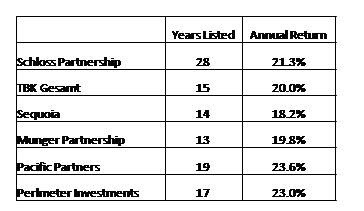 Nevertheless, the company continues to pursue acquisitions, which seems a little strange, considering their return on assets (less than 5%) and return on equity (less than 10%) are nothing to write home about, despite leveraging to the hilt! And they don't seem intent on paying off their debt, as they continue to make sale-leasebacks, where they sell off their properties, but now have to pay rent on them! As long as the company makes its sales numbers, it will be fine. But any unexpected hitch, however small, can cause great damage to the small portion of equity that is left after debt obligations are satisfied, making this company not worth the risk. Most people take comfort in buying stocks that others have. After all, if other people think a stock is good, there must be something there, right? So it should come at no surprise that people love to know what star investors are buying. Not only do they like to know, but it makes them want to buy. For example, shares of CarMax rose 7.5% on the day it was released that Berkshire-Hathaway was buying in. To fill this investor need for knowing what other investors are buying, a plethora of websites exist that track what large funds are buying. Can these be useful in guiding your own portfolio decisions? Unfortunately, a number of challenges exist which make it difficult to gain from this knowledge. Investment companies only have to disclose their transactions at the end of each quarter. As a result, if you base your decisions on what these fund managers do, you could be trading on old news. Under certain circumstances, the SEC will grant funds the right to delay disclosing their purchases, which makes copying these funds' investments even harder. 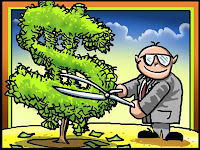 Blindly following the reported investments of fund managers can be detrimental to your portfolio. Nothing beats buying a company for its fundamentals, rather than because others are buying. We constantly hear reports from the media about insider buys, signalling that its time to jump into such and such company. The idea is as follows: if managers and directors are buying (selling) the company's stock, it's probably because they know something the rest of us don't. Since they know more about the company than anybody else, we should see this buying (selling) as an indicator of where the stock is going. If the Brooks Ratio is less than 40%, this signals that insiders are buying. If the ratio is greater than 60%, beware, insiders are selling! Unfortunately, research by Market Profile Theorem, an independent research firm, suggests that although this works to an extent on individual stocks, its best application is on the market in the aggregate. The reason this doesn't work so well with a small sample (i.e. at the individual stock level) is because there are so many reasons why insider buying or selling may not be a clear signal in either direction. First of all, managers and directors have their own lives to worry about. They may be buying a house, may be looking to diversify, or may have just come into some money from salary/bonus or otherwise. Just because they are buying or selling does not mean they are particularly bullish or bearish about the company. Even if managers are buying (selling) because they think the stock will go up (down), it doesn't mean they're right! For example, home builders were buying their own stock in droves when things turned soft last year...only later did they reverse course and believe in the downturn the public saw first. Finally, managers and directors are often paid in stock options. Simply exercising these options is officially a buy transaction, but this signals nothing about the stock, as these managers are simply cashing their bonus or salary cheques. As we discussed here, despite the fact that price increases should shield corporations from the effects of inflation, they actually end up eating up much of the profits in asset requirements. But this cash requirement of the business is hidden from investors, who continue to see rising earnings. 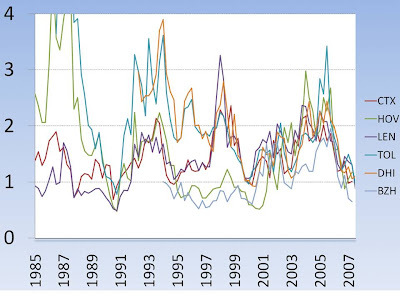 Therefore, what happens to stock prices during inflationary times? Do they continue to rise along with earnings? The answer is no. They key to understanding the argument below is to recognize that as inflation increases, central banks increase interest rates to reduce the money supply and slow inflation down: When interest rates are high, people find it expensive to borrow, and therefore there is less money floating around. 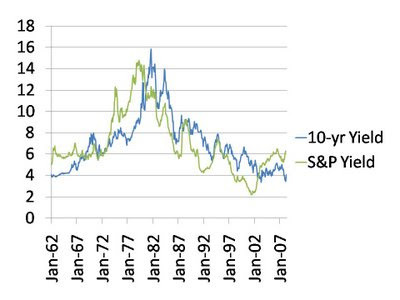 With interest rates are high, people require higher returns on stocks. 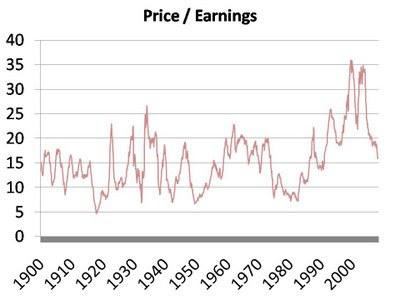 Well, its not so easy to just increase earnings for a stock, so its price has to adjust downward. Consider a stock that sells at $10 with earnings of $1, a 10% return. When government bonds pay 5%, an investor may be willing to buy this stock for the extra 5% return. However, if interest rates were to rise, to say 15%, who would pay for this 10% return, when they could get 15% risk-free by buying the bonds? Therefore, the stock may drop to $5. With earnings of $1, this now generates a 20% return and is once again at a price where an investor might be willing to take the risk on this stock for the extra 5%. 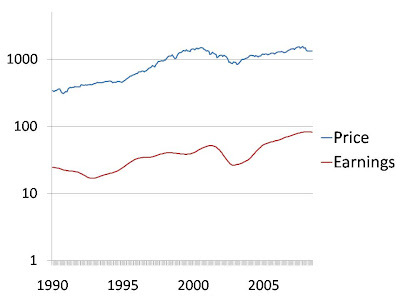 As we can see, inflation compresses P/E values, which can be a painful adjustment for anyone holding stocks. We discussed here that under normal financial/housing conditions, existing home sales would probably be around 5.8 million per year, compared to the 4.9 million pace we're on right now. What about home prices? We know they rose to extreme levels for most of this decade, but we also know they've come down from those levels. We might get a clue as to what home prices will be once things stabilize if we knew, based on income and demographics, what would home prices be right now if we hadn't gone through this bubble? 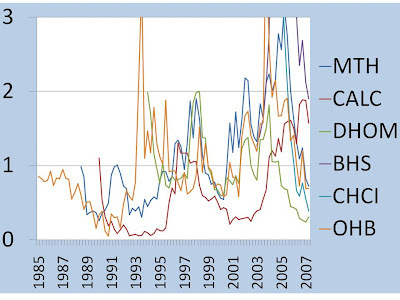 The way Case-Shiller determines the index is quite interesting. The index considers individual homes that have been sold twice, and considers the price appreciation between those sales. 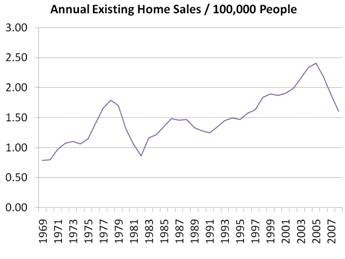 Based on the exponential trend line added below, we see that home prices may be close to normal levels. That doesn't mean they don't have further to fall, however. As long as confidence is low, and the economy is bad, home prices my continue to fall. But for those who have the ability to wait the housing market out until things stabilize, they should be able to realize prices slightly higher than what they are now, presuming the demographic factors that fuelled this trend line continue into the future. We've seen here that certain home builders are showing large discounts to their book values right now. But some of these companies might actually be in trouble. 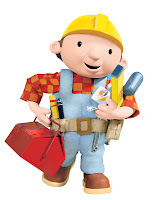 For those who don't have the time to dig through each individual builder's finances, or for those who prefer a diversification strategy, a home builder ETF exists called XHB that tracks a whole slew of builders. However, a closer examination of the underlying securities of XHB reveals this ETF not to be exactly what it purports to be. First of all, it has quite a bit of exposure to retail. 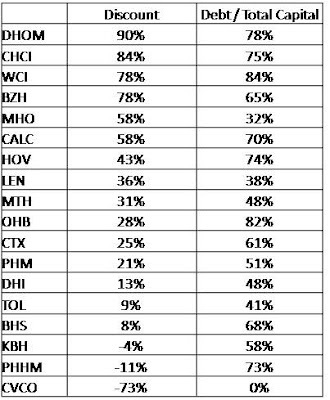 Home Depot and Lowe's make up almost 10% of its portfolio! Another problem is that three of the companies in XHB (Standard Pac, MDC, and Ryland) are heavily involved in mortgage financing. So you thought you were making a play on real-estate, but you end up owning mortgages you know nothing about, for another 10% of your portfolio! Third, this ETF has another 25% of its holdings not in homebuilders, but in home accessories! With companies like Tempur-pedic (mattresses! ), Sherwin-Williams (paint! ), and other companies involved in furniture, carpets, and interior decorating, beware! I'm not saying that these companies don't have some correlations to the housing market, but by no means are these real-estate plays! Finally, the builders we looked at which have the largest discounts to their book values (rankings here), do not even appear in XHB. It's possible they're too small for the ETF to hold without affecting their values. In any case, if you're looking to benefit from the discounts to book values that home builders are trading at, XHB is not for you. Its exposure to retail, mortgage financing and various other sectors (adding up to almost half the portfolio) combined with the fact that even its home builders are not the cheapest ones out there, mean that if you want to take advantage of the discount to book values that are out there, the best strategy is to buy the individual securities yourself! Why such a spread between the top of the list (discounts in excess of 75% book values) and the bottom (barely any discounts!)? It could be that investors believe there are way more writedowns coming for those at the top. Investors may also have more confidence in certain managements' abilities to navigate through these difficult times. 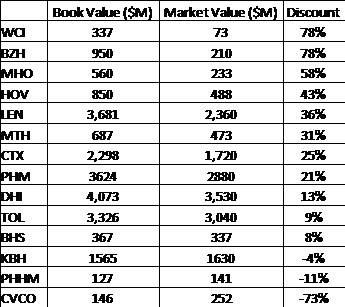 Notice how the largest discounts to book value (in excess of 50%) are for companies smaller than $250M. Also note that the largest companies tend to have the smallest discounts. Could it be that managements for the smaller companies are worse, or that they are more risky, or have higher debt levels? It's possible. Another reason could be that the stock market is less efficient for those smaller companies as we've discussed here (hence we see more variation among the discounts for the smaller companies), since they are too small for many institutions to buy. It's worth taking a closer look at the companies with the largest discounts to book to see if they offer large margins of safety!